Send a Gift They'll Always Remember! Fresh Flowers Make Life Sweeter in So Many Ways. Order Flowers Online - Anytime, Day or Night - or Call Jacksonville Florist & Gifts Today. 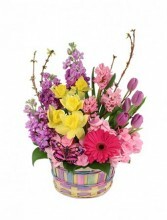 Round Pastelstriped Basket With Liner For Wet Floral Foam, Foliage: Salal Tips, Lavender Tulips, Pink Hydrangea, Yellow Daffodils, Lavender Stock, Pink Hyacinth, Hot Pink Gerbera, Hot Pink And Black Butterfly. You deserve a springtime reward. Jacksonville Florist & Gifts will design a glorious bouquet of spring flowers for your home. Bring in the spring sunshine with a vase of daffodils. Capture the fresh breeze of a spring day with a basket of flowers. Celebrate the simple pleasures of spring with blue iris, pink gerbera daisies or rosy tulips. Feel the day's delight with spring flower arrangements. Everywhere you turn in Jacksonville, AR the revival of spring is felt. Jacksonville Florist & Gifts has a charming collection of spring flowers waiting to brighten your day.